The next time someone says that folk music has lost its conscience, lacks great protest songs, or has lost its connection with its causes, I will sit them down and play Joe Jencks CD, I Hear Your Voice. Jencks sings with a superb tenor voice, and picks flashy guitar that doesnt obscure the beauty of his voice or the words of his well-crafted songs. Joes songs are keepers! Rise Up Singing material! Joe Jencks CD What Kind of Brother, came out of nowhere and blew me away! 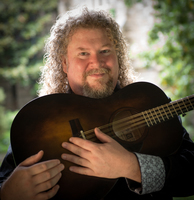 Like John McCutcheon or James Keelaghan, Joe uses folk traditions and history for his carefully crafted and compelling songs. Joe Jencks lyrics knock at the soul, delivering messages of human rights, social justice, and community pride. "Joe's voice is high, clear, and warm. His recording and instrumental backing are first rate." "The best music of its kind I've heard in decades!" "Just about my favorite male vocalist!" "Stan Rogers would be proud!" "Almost as good as me!" The late Mark Spittal, Singer/Songwriter, Healer. He's everywhere!